I can’t recall seeing a dill pickle flavored chip before, but when I googled it, 31 items came up. This is the first time I have tried a dill pickle flavored product and I like it. The aroma of the open bag is fresh dill and the taste follows through. Theses chips have the signature “cascade crunch” of the Tim’s brand and are thick and crunchy. There is a “punch” from the tanginess of vinegar with slight undertones of salty and sweet. If you love dill, you’ll love this chip. If you don’t like dill, I wouldn’t suggest buying this flavor. 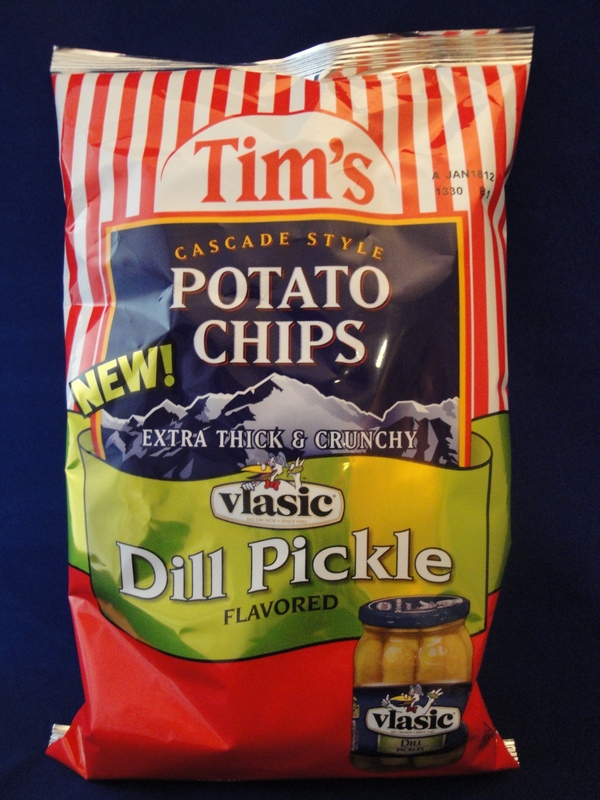 For that reason, dill pickle flavored chips could be considered “polarizing” (not liked by all). This chip would be a bit tastier with a bit more umami flavor, a hint of monosodium glutamate, but not all consumers want this ingredient in their snack foods. Sodium diacetate is on the label as a “seasoning” ingredient. As a flavor chemist, I consider this material artificial vinegar flavor powder. Along with the citric acid, it gives this chip a nice “punch” of sourness. The dill flavor in this chip is very strong and lingers quite awhile, so it’s difficult for me to taste the other spices in the chip. I sense a hint of caraway in the chip as well as dill and onion and garlic powder are on the label. Like all Tim’s chips, I am a fan of this snack. I might buy this flavor again, it’s nice to have choices. Reduced fat is still my favorite. Love this flavor. A must try if you like salt and vinegar chips. Hope Tims keeps making them.